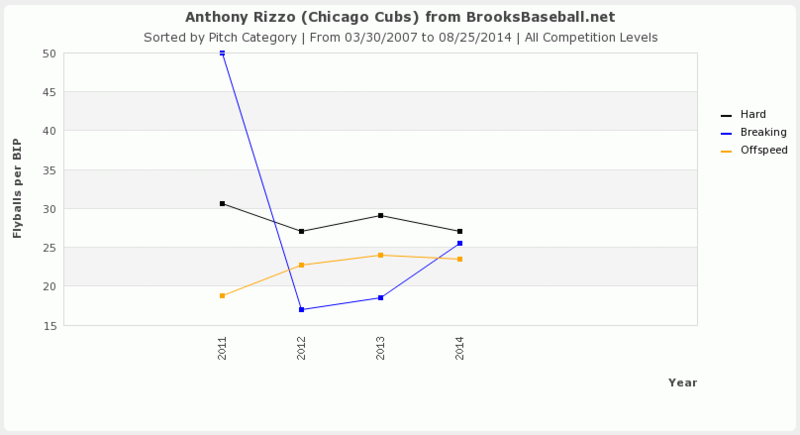 It’s probably safe to say Anthony Rizzo has silenced skeptics this season. After showing tremendous amounts of promise upon receiving a call up in 2012, he struggled in 2013, but the sky didn’t fall; his peripherals were still good, even improving a little. Still, questions remained, and they were fair. The two largest questions, to me, were: could he hit fastballs? and can he perform versus lefties? The fastball thing might seem weird, considering the ratings on his profile, but it’s more to do with scouting reports than anything. During Rizzo’s prospect days, “slider bat speed” was mentioned more than a few times. And its presence in was only amplified after his dreadful 2011 stint in San Diego. Don’t worry about his bat-speed any longer, it’s fine. Eno Sarris addressed it here, though, upon his arrival in 2012, noting the changes Rizzo made in order to be quicker to the plate. If you’re still wondering, though, Rizzo’s performed just fine versus fastballs this year, slugging .511 versus pitches qualified as hard by Brooks Baseball, more than a .70 point improvement over 2013. That’s huge, because the majority of the pitches any batter sees are likely going to be some variation of a fastball. So, while it’s important he’s proven he can, in fact, catch up to heaters, it’s maybe more important that he’s seemingly taken a step or sixteen forward versus breaking stuff. Most major league players get to the majors based on their ability to hit fastballs. They then face an adjustment period. 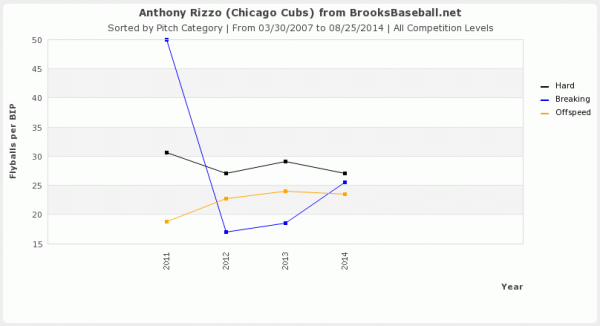 Rizzo’s gone through that period, and the preliminary results are promising. He’s hitting more flyballs this year versus breaking pitches. And considering he’s a power hitter, that’s a fantastic thing. Rizzo’s seen his slugging percentage versus breaking pitches climb from .368 in 2012 to .541 this season. Flyballs are a huge reason. In fact, the only reason Rizzo’s overall flyball rate has increased this season is due to his improvement lifting breaking pitches, although it isn’t near the extreme of 2011’s small sample. (He’s also popping up (IFFB%) less frequently, very key.) Pitchers have taken notice, though, lowering his dosage of breaking pitches again. Good thing he’s proven he can fastballs, anyways, I guess. So, one box – well, two if you include his increased production versus breaking pitches – has been checked. The other – his production versus lefties – has been checked as well. Rizzo’s struggles with left handed pitching were pretty pronounced in 2012 and 2013, when he posted wRC+ marks of 57 and 73, respectively; he’s currently at 161 this year. And he’s gotten there, mostly, by just refusing to swing. After swinging at over 50% of the pitches thrown by lefties in 2012, he offered at roughly 42% last season. He’s only doing so at 38% of their pitches this season. Thanks to his new improving approach, Rizzo’s walk rate has improved every season versus left handed pitching: going from 4.7%, to 10.2%, and finally to 12%. And those gains have also been further buoyed by a declining strikeout rate versus lefties. He’s being more selective and walking more, and swinging and missing less when he offers, all while using the entire field, upping his percentage of balls in play to left field for the third consecutive year. He was due for a little positive babip regression anyways, but he’s only helped his cause by using the entire diamond. The Quick Opinion: For a guy that struck out less than league average and showed good power, Rizzo got a lot of grief for his 2013 season. Make others’ pain your gain by buying low on the Cubbie slugger. Not too shabby, Eno. To update: according to Steamer, only Rizzo, Jose Abreu, Mike Trout, and Giancarlo Stanton are projected to clear thirty-five homers, while also batting over .275. As for next season, Rizzo’s likely going to be a top five option at first base. Add in the fact that the Cubs lineup should improve – in theory, anyways – given Kris Bryant’s expected arrival, and the expected improvement of other young players, and you’re left with a power/average combo that should have a good chance to sniff 90 runs scored and batted in, while having an outside chance at leaving the yard forty times. It sure is fun to watch potential turn into bonafide studliness. We hoped you liked reading Anthony Rizzo’s Answered Your (My) Questions by Landon Jones! Soler is on his way to join the Cubs as we speak. He probably won’t play today but should be picked up. It’s nice when your team’s top prospects stay healthy and are on the cusp of contributing in MLB. As a Twins fan I can say that we haven’t quite has as much luck as Cubs fans this year in this regard. Wow, “luck as Cubs fans” is usually not the thing of envy.